Director Jon Amiel and screenwriter John Collee commence Creation with grand intentions, setting out to use a short span of Charles Darwin’s life as a prism through which to consider the nature of nature. Is the natural world inherently cruel? Are we arrogant to presume it can it be controlled, or even fully understood? As Darwin, Paul Bettany grapples with these questions gravely, semi-reprising his role as Master And Commander’s inquisitive naturalist, only without the joie de vivre. And as Darwin’s wife Emma, Jennifer Connelly recalls her work with Bettany in the science-made-personal drama A Beautiful Mind, a comparison Creation encourages with some similar special-effects trickery and narrative devices. 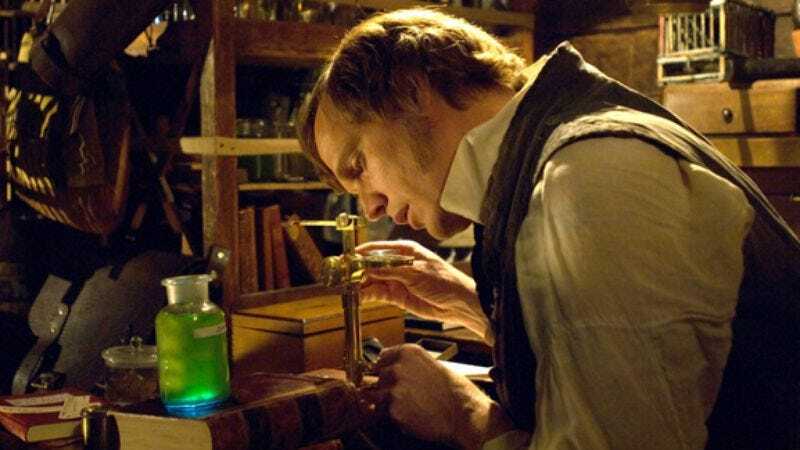 But as the movie plays on, Amiel and Collee’s ambition fizzles, and what begins as a multilayered tale of scientific discovery and cultural history gets reduced to a single maudlin idea: that even Charles Darwin had to evolve. Creation contains some vivid illustrations of evolutionary theory, and some intriguing consideration of what Darwin had to overcome to achieve greatness—in particular, his fear of disappointing his family. But for the most part, Creation is Biopic 101, earnest and over-explained. It’s the kind of movie in which characters have to tell each other over and over just how important its subject is, in case we’ve never heard of The Origin Of The Species. It’s also the kind of movie that reduces the life and work of a major historical figure to something pathetically small. Honestly, when dealing with the man who helped change the way mankind sees its place in the universe, is showing him weeping over his sick daughter for an hour really the best way to tell the story? Creation means to apply theories of adaptation on a personal level, but as it turns out, that’s a far too narrow lens through which to view an intellectual giant.